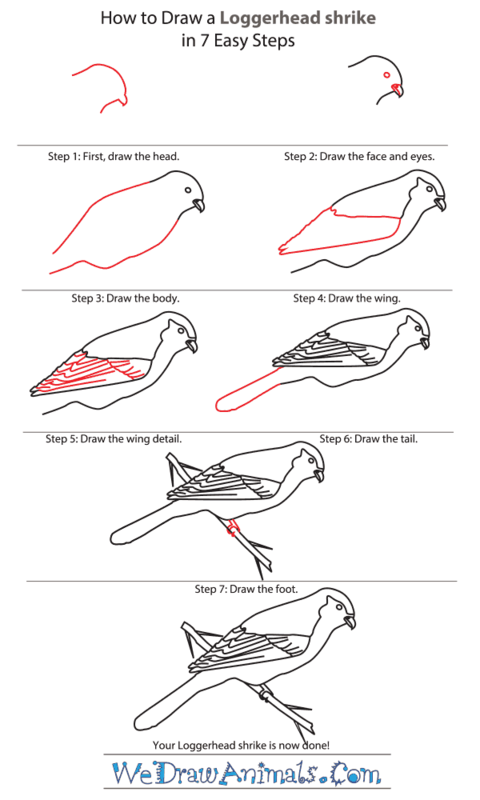 In this quick tutorial you'll learn how to draw a Loggerhead Shrike in 7 easy steps - great for kids and novice artists. At the bottom you can read some interesting facts about the Loggerhead Shrike. 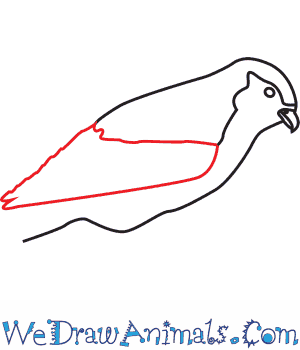 Step 1: Let's draw a dome shape for the head of our loggerhead shrike. This bird is called "loggerhead" because of how large its head is in relation to its body! 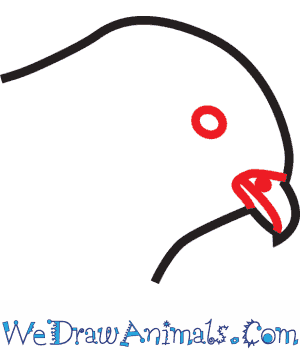 Step 2: Add some detail to the beak. Add a mouth and then draw a small circle for the eye. Step 3: Add a long bent line for the back and another long, crooked line for the belly. 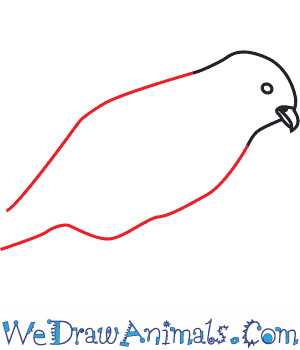 Step 4: Add a triangle shape for the wing, add a notch in the end of it for the feathers! 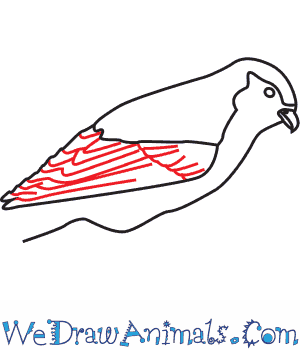 Step 5: Great - now draw the patterns on the feathers. 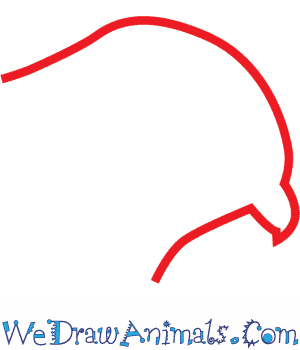 Step 6: Let's continue with a long, rounded tail! Step 7: Looks good! 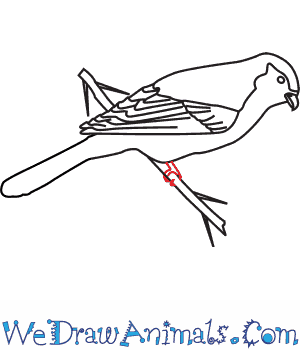 Draw the branch the loggerhead shrike is perched on and add a small foot. Wrap the talons around the branch! Loggerhead Shrikes are considered songbirds, but their eating habits are a scavenger’s. They are normally 18 to 23 centimeters long with a 28 to 32 centimeters wingspan. They can only be found in North and Central America, but they are very wide spread throughout those places. 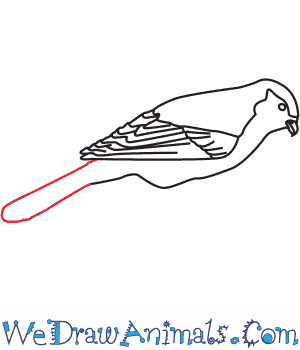 The bird has a white belly and chest with gray and black patches on its wings and back. Loggerheads are more noticed for their sharp beaks and black mask-like stripe across its eyes. A Loggerhead in the North moves south for the winter, but one who is already in the South just hangs around all year. They eat bugs, spiders, snails, crabs, and small mice or rats. There are 7-11 subspecies of Loggerhead Shrike. In Canada the Loggerhead Shrike is critically endangered. A Loggerhead Shrike will pin its prey with thrones or wire and tear it apart with its sharp beak. Considered a songbird, and a passerine bird, meaning it can perch on ledges and branches. 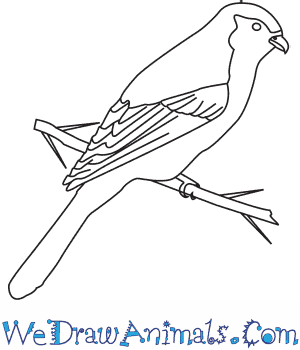 Activity: Draw a Loggerhead Shrike and make copies for each child. Then give the children drawing pencils or charcoal to teach them about the technique of shading.